In movies and television, outlaws can be good guys, bad guys, or some of both. Often, they are defined by the cars they drive. Here's a top 10 list of cars from moving pictures that defined the outlaw in the show. If you're like most Americans, then you love the movies and you've watched your fair share of TV. Whatever the medium, the storyline is always simple: a good guy is up against some bad guys and one or the other (or both) will be epitomized by their mode of transportation. The Lone Ranger had Trigger, Batman had the Batmobile, and Darth Vader had his TIE Fighter. Good guys, bad guys, or someone in-between, they always have a cool vehicle. Driven by the ultimate vigilante crew, the A-Team, this van is about as recognizable as Hollywood vehicles can get. I remember as a kid, worshiping this show (I still know all the actor's real names) and thrilling every time BA Barracus' awesome Chevy flew onto the scene, defying bullets and rarely breaking itself on a jump or skid. Another iconic vehicle that literally defined the movie and graced all of its t-shirts and posters. Starring Kris Kristopherson, this movie had everything: big trucks, outlaw truckers, bad cops, hot women, sweaty Arizona landscapes, explosions, trucker jive on CB radios.. 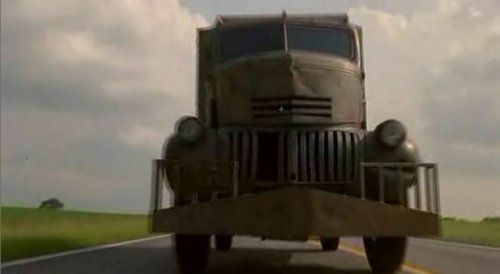 The movie actually used three different models of Mack truck: the posterized RS-712LST, an RS-786LST, and two RS-731LSTs. The differences are minor, but true truck junkies noticed. No list of anything to do with movies is complete without a James Bond reference. Most of the time, Bond's bad guy nemeses drove the usual suspects in rich guy land yachts. In this movie, however, the 355 is pitted against Bond's little Alfa on a fun mountain-esque chase scene set in Monaco. Driven by a Bond girl, of course. Driven by a bad guy with probably the lamest name in the history of movie bad guys, this little Nissan was unnecessarily tricked out for the movie and, in true to FF style, over-styled for the screen. In real life, this car is one of the most sought-after rice burners on the amateur racing circuit. The movie that launched Stephen King's move from novels to the big screen, this was a seriously freaky flick. The car took center stage, becoming the ultimate bad guy as it mirrored the revenge lurking in the main (title) character, waiting to explode into reality. The van is pictured as the title shot for this article and is one of the most evil creations out of Detroit to ever lay waste in a horror flick. Nobody will look at these classic vans the same after seeing this film. Wear diapers. Even creepier than the Chevy Cab Over in #5, this car was literally the star of the show in this horror flick. On top of that, the plot line was really, really cool and has amazingly not been copied and re-done 10 times over by today's "rip off the past, original ideas are for losers" Hollywood production crowd. I mean, they remade Footloose for hell's sakes. You know you're grasping at straws when you make new versions of that kind of crap. This movie contains some of the best car chase scenes ever put to film and the pinnacle vehicle is the car chosen by the team's getaway driver, fitted with nitrous oxide power-boosters to add to the fun. Notably, every car chase scene in this movie (there are a lot of them) was filmed live with no CGI. Of course, one number earlier than the '70, the '69 has a much cooler model year and thus is a much cooler "good guy outlaws" car. The Good Ol' Boys on the Daisy Duke Show made the most of this car, the General Lee. It's probably the most-recognized, iconic television car of all time. Everyone takes one look at the bright orange paint, the "01" on the side, and the Dixie flag across the top and they know this is the General Lee. Of course, topping the list has to be the bad guy car from the single most awesome car chase action sequence ever filmed. When most people talk about this movie, they talk about Steve McQueen in his 1968 Ford Mustang, but the real stars were the 440s chasing him, which often had to slow down so as not to catch up too quickly, according to documentary accounts from stunt drivers in the film. Incidentally, Ford remade this scene in homage to the original, using a new Mustang in the Fox TV series Alcatraz, which aired last night. So there you have my list of the top 10 outlaw cars from film and television. Honorable mention goes to the 1967 Shelby Mustang GT500 in Gone in 60 Seconds, which didn't make my list, but is worth mentioning because it was in contention. Got a favorite? Tell me about it. Sign-up to our email newsletter for daily perspectives on car design, trends, events and news, not found elsewhere. How about the ultimate good guy gone bad in his Holden Monaro? Yes I'm talking about MAD MAX.